New feature! Simulated Prep Test. 150 randomly generated questions, with 3 Hour time limit! Prepare for your PEBC Qualifying Exam or Provincial Practice Review with confidence. Challenge your current skills and knowledge. Identify areas to focus your studying. Study when you want, where you want, for as long as you want. Increase your chance of success! 1. What is iMCQ for Pharmacists? iMCQ for Pharmacists is a large database of multiple choice questions to help pharmacy students prepare for the PEBC examinations (Pharmacy Examining Board of Canada). The questions written are intended to cover all seven NAPRA (National Association of Pharmacy Regulatory Authorities) competencies you must know to successfully pass the PEBC examinations. The questions have been written by several pharmacists and reviewed by a pan-Canadian pharmacy panel. A digital clock that will keep track of your time while answering the questions. The multiple choice questions prepared are NOT intended to replace your studying but to complement your studying and test your knowledge. New topics are added on a regular basis. While every attempt has been made to cover a large number of topics, not every therapeutic topic is covered. There is also a prep exam of 150 randomly selected questions with a 3 hour time limit. The prep test can be taken any number of times. Each time you take the prep test another selection of questions is selected. NOTE: there is no automatic renewal. If you want to subscribe for a longer period of time, you must go into iMCQ and renew through Paypal. 2. How do I use iMCQ for Pharmacists? 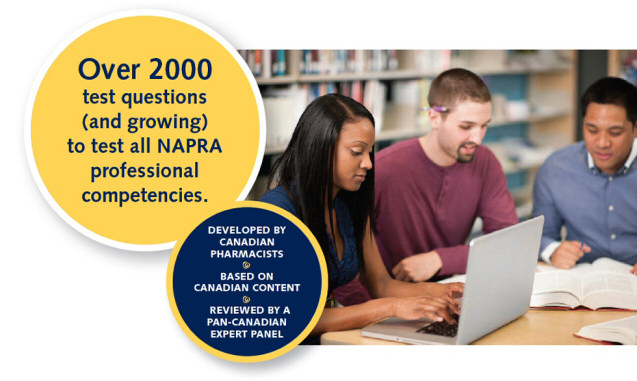 There are many topics covering the seven NAPRA competencies. Besides many therapeutic topics, there are topics including jurisprudence, ethics, drug distribution, team work and pharmacy management. Once you select a topic by clicking on it, you will have two chances to answer each question. If your answer is incorrect on the second attempt, the correct answer will appear. The correct answer will appear usually with an explanation and / or reference. If a reference does not appear, it is intended to make you find the reference explanation yourself. NAPRA competency #4 (Drug, Therapeutic and Practice Information) requires you to find evidence based information on your own. The results of each subject area are tabulated on your dashboard to help you identify your strengths and weaknesses. 3. Are the iMCQ questions similar to PEBC? This is a hard question to answer since PEBC does not publish past multiple choice questions. Based on the sample questions provided on the www.pebc.ca website, our iMCQ questions are very similar to those on the PEBC. Of course, some questions are easy and others are more difficult. Some questions are case-study based; other questions are not. Based on emails we receive, iMCQ has helped many pharmacy students prepare for the PEBC. 4. What is the iMCQ dashboard? The iMCQ dashboard will help track your progress. You can determine which subject areas need more work. A bar graph will tabulate your results and let you know what subject areas you need to work on. 5. Will iMCQ help me prepare for any other country examinations? We are not sure what other countries test on their licensing examinations. The therapeutics questions should be the same or very similar as in other countries, however the jurisprudence questions will definitely be different. Other competencies may not be tested in other countries. 6. How do I study for the PEBC examinations? We are always willing to address your questions and concerns so please add to our blog. 7.What do I do if I find errors or omissions? Medical knowledge is advancing at a very rapid pace and it is difficult for all health care practitioners to keep up-to-date. We will make every effort to keep the questions relevant and up-to-date. If you notice any errors or omissions or changes, please notify us at mail@agrohealth.com. We'll be happy to investigate and post the new updated information when required. Pass the PEBC exam for Pharmacists the first time with iMCQ. Full access includes a simulated prep exam plus access to all the review questions. Pharmacist, Dom D Pharm Inc.
Bruce Dalton, BScPhm, PharmD - Pharmacy Clinical Practice Leader, Infectious Diseases, Alberta Health Services, Calgary Zone, Calgary, Alberta. Artemis Diamantouros, BScPhm, MEd - Pharmacist, Sunnybrook HSC, Assistant Professor (Status Only), Leslie Dan Faculty of Pharmacy, University of Toronto, Toronto, Ontario. Sean K. Gorman, BSc(Pharm), ACPR, PharmD Regional Coordinator (Clinical Quality and Research), Pharmacotherapeutic Specialist (Critical Care), Pharmacy Services (Interior Health Authority), Clinical Associate Professor (Faculty of Pharmaceutical Sciences), University of British Columbia. Dave Hughes, B.Sc. (Hons), B.Sc.Phm 2013 (Candidate) - University of Waterloo School of Pharmacy (Rx 2013), Kitchener, Waterloo. Natalie McLeish, BScPhm, PharmD, ACPR - Community Pharmacist, Angus Borden Guardian Pharmacy, Angus, Ontario. Dorothy Pardalis BSc.Phm. CDE, CAE - President, Proactive Health Strategies, Inc., Windsor, Ontario. Lisa McLean, R.Ph.T. - Senior Lab Demonstrator Professional Practice, School of Pharmacy, University of Waterloo, Waterloo, Ontario.